When actress Genelia Da��Souza delivered a baby boy last week, I could see the name coming from a thousand miles. 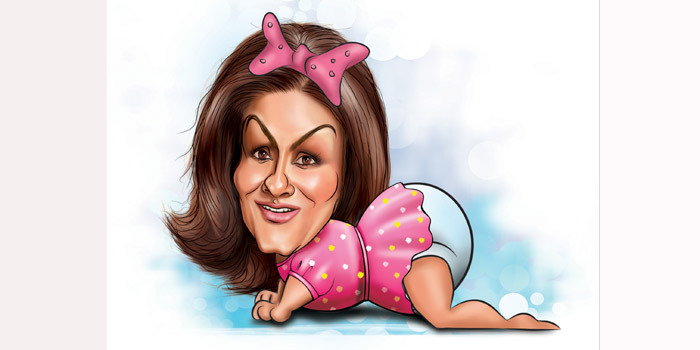 Mrs Riteish Deshmukh named her child a�?Riaana�� (the Persian word for a�?Little Kinga��). Riaan was quite predictable as it happens to be a portmanteau of sortsa��of the parentsa�� first names. I am sure, if it had been a daughter, theya��d have called her a�?Riaaha��. More because Riaah and Riaan have the same name number as their numerology-loving dad. To put things in perspective, slicing and dicing sound components of mom and pop names is the most common baby naming trick among Indian celebrities. Forty years ago, when Ravi Tandon (the director of Khel Khel Mein) and his wife Veena were fishing for a sweet name for their girl, they christened her Raveena Tandon. In 2001, Saurav Ganguly and Dona Roy applied the same template when they picked Sana for their little one. The Riaan nomenclature is but the latest instance of deployment of this time-tested formula. Incidentally, Amrita Aroraa��s son is Rayan and Madhuri Dixita��s boy is Ryan. The inadvertent choice of a commonplace name is again a commonplace problem in India. Which is why celebs walk that extra mile to look different. Fathers and mothers in search of uniqueness would do well to worship Arshad Warsi and Maria Goretti. They selected the rather bizarre Zeke Zidaan and Zene Zoe for their kids. Another Zed freak is Shikhar Dhawan. Although he chose the more conventional Zorawar (Arabic for a�?bravea��). Opting for foreign sounding names is the easiest way to stand out from the unwashed masses. When Farah Khan and Sirish Kunder had triplets, they turned to Russian for Anya and Czar. The third one was given the very Latin, Diva. Farhan Akhtar, true to his Twitter moniker of being @FarOutAkhtar, handpicked the Japanese Akira and the Buddhist Shakya for his children. Sushmita Sen favoured the French Renee (meaning a�?reborna��) for her first daughter. Konkana Sen Sharma and Ranvir Shorey have to be handed the most literate couple award for naming their son Haroon after Salman Rushdiea��s Haroun and the Sea of Stories. But the most well-read Indian cricketer, Rahul Dravid, wasna��t very adventurous when he chose Samit and Anvay for his sons. Like always, perhaps, he was playing by the book. Spotted a zingy celeb baby name? Share your scoop with anantha@albertdali.com.